Synergy’s 3rd Sale “go-to-market” approach is one of continuous engagement and strategy monitoring through the supply chain sales and communications demands to operator reception and consumer awareness. Go-to-market strategy lightens the heavy lifting of pioneering, improving products sales worthiness, ROI performance demands, improving sales teams quality of time management and financial resource exposure. Morehouse is a company that has always stayed one step ahead of the competition. 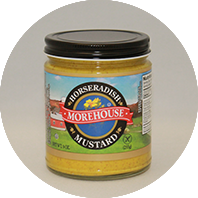 Since we began making mustard in 1898, we have remained focused and committed to making it better than our competitors. In recent years, we have created a number of new varieties to satisfy the creative desires of 21st Century consumers.